Christopher Monckton is at it again, spreading climate disinformation. Today he's taking on Reuters and the World Meteorological Organisation and losing - badly (archived here, latest here). Anthony Watts had a brave headline accusing Reuters of fraud. It's not Reuters or the World Meteorological Organisation that is committing fraud. It's Anthony Watts and Christopher Monckton who are deliberately deceiving the public and publishing false information. They are the anti-science brigade who want the world to burn. Next, Reuters unquestioningly repeats that “The average temperature in the first six months of 2016 was 1.3° Celsius (2.4° Fahrenheit) warmer than the pre-industrial era of the late 19th Century, according to space agency NASA”. Unh, no. Even if one relies upon the most tampered-with and prejudiced of all the global temperature datasets, that of “space agency NASA”, the rate of global warming since the dataset began in January 1880 has been less than 1 degree, equivalent to a mere 0.7 degrees per century. Not exactly scary. It’s well within natural variability. Let's do a check. Using NASA's GISTemp, the average annual surface temperature for the thirty year period from 1881 to 1910 was -0.26 °C lower than the 1951-1980 average. The average for the first six months of this year was 1.09 °C above the 1951-1980 average. That makes the first six months of this year 1.36 °C higher. What about his "mere 0.7 °C per century". Christopher's trick was to use a linear trend since 1880. 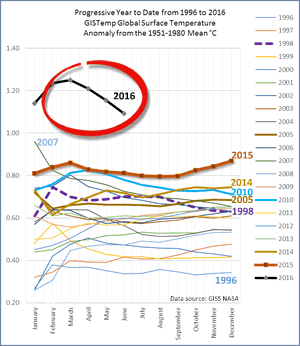 However as you can see in Figure 1 above, since the mid 1990s, the temperature has been above the linear trend. In other words, the trend since 1880 has not been linear. Using change point analysis, it has been shown that the last time the trend changed was in the mid 1970s. Since then the trend has been 1.7 °C a century, far above Christopher's 0.7 °C a century. As for being "well within natural variability" - no. The surface temperature today could not have been achieved without the added CO2 that we're putting in the air. Below is Figure TS9 (b) from the IPCC AR5 report. The black line is the observed temperature (to 2012 I think) and the red line surrounded by yellow is the modeled temperature with natural forcings only. I don't have time to pick apart all the other silly things in Christopher's article, including his woefully deceptive speedo diagram (which is plain wrong). I'll just say for now that it's wrong (and silly). I might write more about that another time. The earth is on track for its hottest year on record and warming at a faster rate than expected, the World Meteorological Organization (WMO) said on Thursday. June marked the 14th straight month of record heat, the United Nations agency said. It called for speedy implementation of a global pact reached in Paris last December to limit climate change by shifting from fossil fuels to green energy by 2100. I'm not in a position to question the World Meteorological Organisation, but I will say that with or without accounting for actual forcings, I'm not yet convinced that the earth is warming at a faster rate than expected. Below is a plot of the monthly observations compared to CMIP5, from January 1975. Remember, the CMIP5 forcings since 2005 are an overestimate, so the multi-model mean is warmer than would be expected with actual forcings. Even so, I think it will take a while longer before it can be said with any certainty that the world is warming faster than expected. We should not only talk to each other here but also quietly let the outside world know the truth. The truth will prevail eventually, but the more we call out the peddlers of falsehoods the sooner it will prevail, and the fewer innocent people the terrible policy consequences of their falsehoods will kill. Is RHS a real person or a bot spamming blogs? His or her comment makes no sense. As long as they have a source they can throw under the bus, they will get away with almost anything. Of course the crux of AGW is not that it is warming but that warming can be attributed to fossil fuel emissions. The only empirical evidence presented for that are (1) a high correlation between cumulative emissions and cumulative changes in atmospheric CO2 and (2) a high correlation between cumulative emissions and cumulative warming (i.e. surface temperature). Both of these correlations are spurious and therefore they do not serve as empirical evidence. Pop Piasa builds a strawman, Telltale Technique No 2 of climate science denial. I think that the Reuters doomsday reporting only reflects the current market in the media. If you want the boss to promote you, you write something sensational. Reporting that climate change has not been particularly extraordinary since the turn of the century will not get you a raise, particularly if your employer has invested in renewables or is controlled by liberal “polititricksters” (to quote my Jamaican friends). "I once saved the owners of the swank rent-a-suite megaship The World from losing a fortune when her otherwise perfectly sane skipper had conceived the notion of sailing her through the North-West Passage, and had sold them on the idea." Simply not true...the ship had a quite uneventful cruise of the North West Passage in 2012. Monckton just can't stop telling porkies, can he? If he lies about everything else (I'm a member of Parliament, I've cured HIV, etc. ), what does that say about his climate-related ramblings? Monckton thinks he deserves attention. His need for it overwhelms his regard for reality. It's long established that it can safely be assumed that all Monckton claims are falsehoods. WUWT are helpless in the hands of people like Monckton. They must find something daily to get outraged about, and who is he to not enable their habit? Being both a nonentity and a self-publicist has an inherent problem that can be solved in only one way. I saw Monckton when he brought his carnival act to San Diego a few years ago. The audience was a really sorry collection of birthers, gun-nuts, science-deniers, tea-partiers, etc. from the east San Diego County hinterlands. Monckton, sad to say, was one of the sanest people in the room. *That's* how nutty the crowd was. I wouldn't be surprised if the guy starring in this video (recently recorded near Ramona, a town in east San Diego county) was there. He would have fit right in! For those not familiar with the San Diego region... coastal San Diego has UCSD, the Scripps Institution of Oceanography, the Salk Institute for Biological Studies, the Scripps Research Institute, etc. East San Diego County has the Creation Research Museum and meth labs. To it's credit, east San Diego county also has Mt. Palomar, so it is not completely drenched in ignorance and hate. chaamjamal in his WUWT comment is using the old tobacco playbook a little too directly. I remember it well. There have been discussions of this elsewhere. A lot of it has been rooted in one mistake that Reuters did make, which was to refer to "the late 19th century" as "pre-industrial". You really can't apply "pre-industrial" to anything much after the early 19th century. Reuters seems to have gotten the statement from this NASA post, but added the "pre-industrial," which was not in the original. Somehow this rather insignificant mistake is supposed to demonstrate rampant corruption and/or incompetence at Reuters, and I've even seen it extended to NASA, even though NASA never said anything about "pre-industrial." "You really can't apply "pre-industrial" to anything much after the early 19th century"
Except more than nine tenths of the globe. I'd be interested in seeing the discussions, Chris. Is there a reasonable estimate of global surface temperature in the late 1700s early 1800s anywhere that anyone knows about? I'd say it would need proxies to be useful, and most proxies would probably be quite a bit more crude than instrumental data. Berkeley Earth goes back to the mid 1700s but for land only. For the southern hemisphere it only starts in the mid-1800s (unsurprisingly) - and that's for land only. 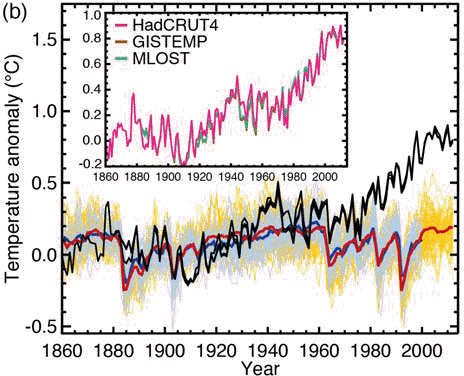 BEST second half of the 1700s on land were warmer than the late 1800s. BEST (land and ocean) for much of the second half of the 1800s was probably just a tad warmer than the late 1800s/early 1900s. The Little Ice Age is another spanner in the works of what would be considered a reasonable value to use. I'm happy to stick with 1881-1910 for GISTemp, and 1851-1880 for HadCRUT as the ballpark to measure from, unless anyone has better numbers. The Industrial Revolution is generally considered to have extended from about 1760 to about 1840. Here is one of the more measured discussions. I saw a couple that were far more incendiary, but I can't remember where they were. I have no problem with the comparison to 1880-1910. I just don't think it should have been characterized as "pre-industrial," especially since Reuters was essentially quoting NASA, and NASA didn't say that. OK, so, from Victor's comment, it was Reuters quoting the WMO quoting (misquoting, IMO) NASA. The underlying point remains: There's nothing wrong with the 1.3C number, but in my opinion it is not pre-industrial, so it doesn't really relate to (for example) the Paris agreement to limit the increase to 2C over pre-industrial temps. Thanks Chris. I suspect whatever is settled upon as the "pre-industrial" baseline will be close to the average of the first 30 years of the instrumental record, or maybe just a tad higher in the case of GISTemp's first 30 years. 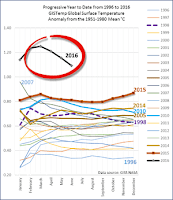 That's going by this chart: Fig 5.7 (c) from the IPCC's AR5 report. "Pre-industrial" isn't the point as much of the early Industrial Revolution used water and biomass for power. For example charcoal was used for ironmaking in much of the 19th century. The real point here is to establish the fossil fuel takeoff point. The press release of the WMO does not say anything about "faster than expected". If that does not come from a press conference, that seems to be an interpretation of Reuters. That interpretation could be defended. There are many changes in the climate system, many are going faster than expected such as sea level rise and Arctic sea ice. The press release does not just talk about temperatures. It could also be that the journalist believed the propaganda of Monckton and Co. that there was such a thing as a "hiatus". Then seeing this imaginary period evaporate could be seen as faster than expected warming. The part about pre-industrial does not come from Reuters, but was already in the WMO press release: "The average temperature in the first six months of 2016 was 1.3°C (2.4°F warmer than the pre-industrial era in the late 19th century, according to NASA." Scientifically I would say it is clear what they mean, a change relative to the beginning of the instrumental temperature estimate before 1900. This period was likely a little colder than the pre-industrial average because of some volcanoes. There was a first study that tried to quantify this difference; a few tenth of a degree Celsius becomes more important now that we will likely get quite close to the 2°C limit because we failed to act fast enough. Thanks, Victor. That all makes sense. The "warming faster than expected" got me. I find it easier to accept that was just the Reuters' reporters interpretation than something the WMO said. I thought I heard somewhere that there'd been or is currently an attempt to pin down what the "pre-industrial" benchmark is. Perhaps it will be done for the upcoming IPCC report - due in 2018. I don't imagine it will be easy since there aren't enough instrumental records going back, plus natural variability will mean that some sort of averaging will be needed. I do not know whether this is already published: Estimating pre-industrial global temperature. >>...conclude that 2015 was likely the first year in which global temperatures were more than 1 ◦C above pre-industrial levels. By my calculation that would make the estimate of the pre-industrial baseline for GISTemp somewhere between -0.26 ◦C (the 1881-1910 mean) and -0.14 ◦C below the 1951-1980 mean. "The part about pre-industrial does not come from Reuters, but was already in the WMO press release"
What the Reuters piece adds though is the claim that we are close to reaching the Paris lower-limit of 1.5°C above pre-industrial levels. Whilst I'd hate to agree with Monckton on anything, that does seem misleading if "close to" is only referring to the last 6 months. Did you read the Reuters article Bellman? It doesn't directly link the last six months with reaching 1.5 C. And it does point out that El Nino accounted for a lot of the recent record high temperatures. Even if the rate of warming doesn't pick up, we're on track to hit 1.5 C above the average of 1881-1910 before two decades is out. That's "soon" and getting sooner every year, and probably not enough time to stop that from happening. "Did you read the Reuters article Bellman?" Yes I did, but probably not closely enough. Re-reading I agree it doesn't directly link the last 6 months to the 1.5C target and may have been referring to the next two decades. And no, there's practically nothing I could agree with in this article, or anything else Monckton says or writes. From the perspective of greenhouse gas induced climate forcing most any time up to 1900 can be approximated as "pre-industrial." Concentrations were around 280 ppm in the mid-late 1700s and were still only in the 290-295 range in the late 19th century. It wasn't until 1915 that CO2 reached 300 ppm and even in the WWII era concentrations were only 10% higher than their pre-industrial values. I think it's often underappreciated that the increase in CO2 is essentially a modern phenomenon. Fully half of the increase since pre-industrial times happened after 1983. And the build-up is fastest now. I think your comparison between CMIP5 and GISS temperatures may look very different if you focus on anomalies relative to the 1961 to 1990 averages. My quick analysis indicates CMIP5 values far above recent GISS values. Dr No - that's interesting. I took a look and found that it's just a quirk of the averages for the particular thirty year periods. Using annual temperatures, with CMIP5 the difference between the average of 1961-1990 and 1951-1980 is 0.69C. The difference between the averages for GISTemp is 0.10 C. So when you shift GISTemp baseline up to the 1961-1990 as zero, you're shifting the CMIP5 chart up by 0.03C more than the GISTemp chart. thefordprefect pointed this out some time ago, and it took me a while to see what he was getting at. (That's because I just use a rough and ready approach, mostly to compare datasets.) He's right though. For the same reason, you find that the differences between datasets appear huge if you align them all to, say, a baseline of 1880-1910. On the other hand, they line up quite well if you use a 1981-2010 baseline. That's because there are much bigger differences between them in the early years than in more recent years, which is what you'd expect. I should add that KNMI appears to adjust the CMIP5 baseline *after* working out the multi-model mean. If the calculation was done on each of the members of the ensemble separately and the baseline for each was worked out, then only after that the new CMIP5 mean was calculated, there would be a different result. As well, the envelope of the multi-model mean would straddle GISTemp whatever approach was taken. As a final bit of trivia, I compared the two using the baseline for CMIP5 that was used in the IPCC report - 1986 to 2005. The difference in that case, compared to using the "native" GISTemp baseline of 1951-1980, is 0.009 C instead of 0.03 C. That is, CMIP5 is effectively shifted up by 0.009 C relative to GISTemp compared to the chart above. Yes - the choice of baseline is tricky. It is a sensitive issue because skeptics make a song and dance over the difference. The possibility that the CMIP5 models are slightly too warm is actually an entirely separate issue to the robust observed warming. In any case, the difference is not that great. "If the calculation was done on each of the members of the ensemble separately and the baseline for each was worked out, then only after that the new CMIP5 mean was calculated, there would be a different result." I suspect that you will find that there may be no difference since all the operations are simple arithmetic.